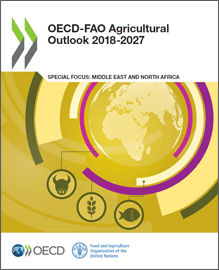 The OECD-FAO Agricultural Outlook can be downloaded for free from the OECD iLibrary The Spanish version is also available. The extended version of the Outlook is available here (PDF). Key analysis available in the Executive Summary (EN, FR, ES, CH, RU, AR; other multilingual versions are available here). To compare trade, production, consumption and prices between countries and commodities, consult Compare Your Country. Can Brazilian agriculture balance growth, equality and sustainability? Who benefits from lower food prices?